If you like blueberry pie, you will love this twist on the summer classic—and you don't have to wait until summer to enjoy it! This 1st Prize winning recipe combines lemon pudding with cream cheese and white morsels for a sumptuous filling topped with blueberry preserves. Perfect for picnics and family reunions! From the kitchen of Merna Hanson of Juniata, NE. For Crust: Grease a (10-inch) pie plate. Place morsels and butter in uncovered, medium microwave-safe bowl. Microwave on MEDIUM-HIGH (70%) power for 1 minute; STIR. Morsels may retain some of their original shape. If necessary, microwave at additional 10 to 15-second intervals, stirring just until morsels are melted. Stir in cereal until coated. Press onto bottom and up sides of prepared pie plate. For Filling: Combine pudding mix, sugar, egg yolks and water in medium, heavy-duty saucepan. Cook over medium heat, stirring constantly, until mixture comes just to a boil. Boil for 1 minute. Remove from heat. Add morsels; stir until melted. Refrigerate for 1 hour or until cool. Beat cream cheese in large mixer bowl until smooth. Beat in pudding mixture. Fold in whipped topping. Spoon into crust. Refrigerate for 1 hour or until filling is set. Spoon blueberry preserves over pie just before serving. 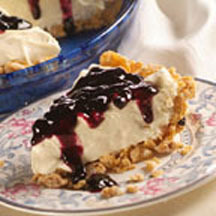 Tip: Combine the blueberry preserves with 1 pint of fresh blueberries to use as a topping. Nutritional Information Per Serving (1/12 of recipe): Calories: 570 Calories from Fat: 230 Total Fat: 25 g Saturated Fat: 18 g Cholesterol: 65 mg Sodium: 170 mg Carbohydrates: 82 g Dietary Fiber: 3 g Sugars: 51 g Protein: 7 g.